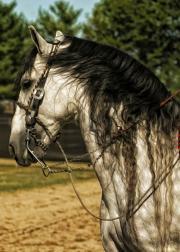 Andalusian Beauty. Horse Art. Chris Weigl. Matted 8 x 10 print. Long time equestrian and renowned photographer Chris Weigl here captures a fantastic Andalusian who performed at the World Equestrian games in Kentucky 2010 with a Spanish rider. The horse exuded amazing beauty, energy and spirit. TheHorseStudio.com review: The definition in the distinctive mane complete with soft curls is beautiful in this picture. The baroque heritage and nobility shine through and Chris has done a great job in showcasing the magnificence of this breed. This print is on Kodak professional metallic paper and the high gloss paper makes the image pop, enhances color saturation and provides exceptional sharpness. Photographs are 5 x 7 inches matted in a heavy duty 8 ply archival white 8 x 10 inches mat. The extra thickness of the mat gives the finished piece a museum-like quality.